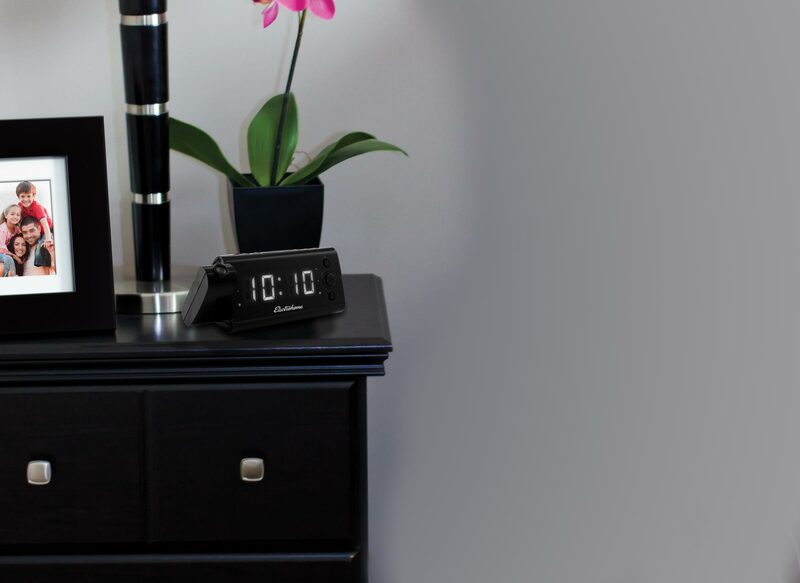 Always wake up on the right side of the bed with the USB Charging Alarm Clock Radio by Electrohome®. This device’s built-in USB port means you’ll never be looking for the charger of your smartphone, tablet or mp3 player. This and a collection of other awesome features, including time projection automatic time set, long lasting battery backup, programmable dual alarm, and digital phase locked loop radio tuner, make this one reliable clock radio you can depend on. How many times have you laid down in bed intending to recharge your USB device, only to realize you left your adapter all the way in the kitchen? 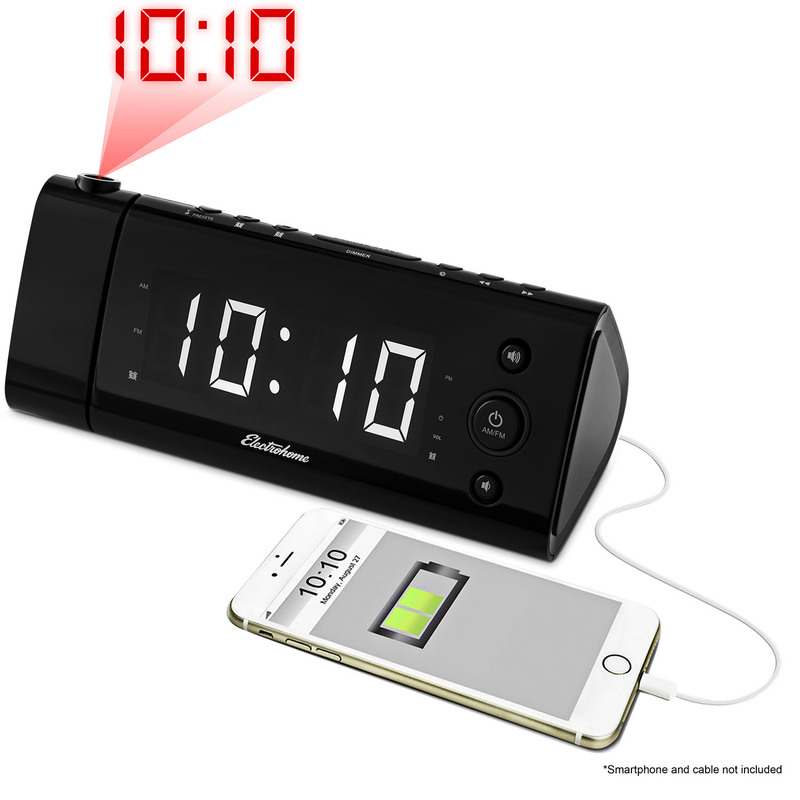 Leave a charging cable plugged directly into your clock’s USB port to create a powerful nightstand USB charger for your iPhone, iPad, or mp3 player. Save yourself from the continuous hassle of remembering your power adapter while you free up an outlet at your bedside with this high-speed charger. Your smartphone will be fully charged every morning – just like you. Twisting and struggling to see the time when you’re half asleep isn’t pleasant. So this projection clock radio, with 180-degree swivel, projects the time right onto your wall or ceiling for easy, stress free viewing – all you have to do is open your eyes. You’ll always know what time it is without compromising your comfort zone. Turn on or off as needed. The convenient SelfSet™ feature makes setting up your clock a snap; simply plug in this device and its preprogrammed date and time settings (preset to Eastern Standard Time) are instantly brought to life on its large 1.2” blue LED display with four dimming options – no squinting required. This feature, when coupled with the clock’s digital frequency display, eliminates the awkward analog tuning band found on most conventional alarm clocks and takes the guesswork out of programming presets and seeking your favorite radio station. Phase-locked loop (PLL) technology gives you the best possible reception and sound quality by digitally locking in on the strongest point of your favorite AM/FM radio signals for a static-free listening experience. With enough memory to program 20 radio station presets, your ears will soon be singing “P-L-L”. Never worry about a power outage disrupting your morning routine again with reliable WakeUp™ technology, developed exclusively by Electrohome®. The built-in battery backup automatically activates when the power is cut off from your wall outlet. Your alarm will still sound according to your settings while the correct date & time is maintained. Rest assured knowing your alarm clock will have power even when the rest of your home does not. This clock boasts several function specifically designed to make your life easier. Do you wake up early Monday to Friday but prefer to sleep-in on weekends? Is your partner’s schedule different than yours? The easily programmable dual alarm can be tailored to fit your weekly routines so you won’t have to worry about rescheduling your daily wake-up call. Ever catch yourself wondering if you’ll forget Daylight Savings Time (DST) changes again this year? When you first plug in your clock radio and specify your time zone, DST will be automatically updated every spring and fall. This clock displays both the date & indoor temperature (Celsius or Farenheit) in addition to the time so you’ll be able to check all your vitals at a glance. And thanks to this device’s user-friendly controls, you can easily take advantage of the Sleep timer and the option to wake to buzzer or radio – greet each morning with your favourite radio show. J’ai un radio réveil à chargement USB avec projection de l’heure, mais j’ai perdu le manuel d’instruction, pourriez vous m’en envoyer un s.v.p. Great clock! Great price ! Snooze button is not user friendly. Like the look but if you use the snooze button a lot this clock is not for you. The snooze button is very narrow and hard to find when you are still in the process of waking up. Once you find it it is very hard to push down. It takes a lot of effort and you have to angle your finger just right.. The sound of the alarm is also very ear-piercing. I know it is supposed to wake you up but the ring could be less shrill and would still work. Purchased this product two years ago. All of a sudden...it lost all displays. $35.00 then. $28.96 today!